Ogden, Utah (September 3, 2015)- Ogden, Utah is no stranger to competitive cycling events. The Tour of Utah, XTERRA and USA Cycling have all presented races in Ogden attracting national attention. 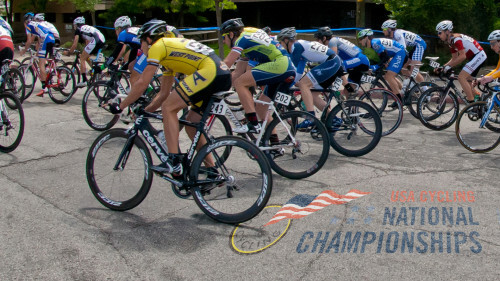 The next cycling event coming to the area will be the USA Cycling Masters Road National Championships September 9-12. An estimated 700 cycling athletes from all over the nation are expected to race in the four-day event. The Championships will begin with a Time Trial on September 9 at Antelope Island. Road Race Championships will take place September 10-11 in the upper Ogden Valley, starting and finishing at Snowbasin Resort. The final event for the weekend will be Criterium Championships held in downtown Ogden. All races are spectator friendly and the community is invited to participate and cheer on the cyclists. Spectators will be able to travel to Antelope Island to enjoy the Time Trial Championships and explore the island. Races take place from 9-2:00 p.m. Champions will receive their stars and stripes jersey at an award Ceremony in the Ogden Union Station Courtyard at 6:30 p.m. The Road Championships at Snowbasin Resort test riders’ physical endurance making it an ideal venue for the race. Spectators will be able to watch athletes start and finish the race at Snowbasin Resort. From Snowbasin, athletes will fight for the podium by racing down Trappers Loop, around Pineview Reservoir and up Old Snowbasin Road. Food trucks and Daily Rise Coffee will be on-site for guests to enjoy. On Thursday the Championship will be from 8:15-5:30 p.m.; athletes who earned their stars and stripes jersey will be awarded at 8:00 p.m. in the Ogden Union Station Courtyard. Friday’s Championship will be from 8-2:30 p.m.; awards will take place at 5:00 p.m. in the Ogden Union Station Courtyard. A crowd favorite, the Criterium Championships will take place in Downtown Ogden from 7:00 a.m. to 8:15 p.m. In addition to the race, the Ogden Farmers Market will be selling fresh produce, local goods and artwork from 8-1:00 p.m. There will also be an expo, food vendors and a Sierra Nevada Beer Garden at the Ogden Amphitheater from noon-10:00 p.m. There will be two award ceremonies on this day in the Ogden Amphitheater expo area, 12:15 p.m. and 8:30 p.m.
Because of these races, rolling and hard road closures will occur in the Ogden area. To view these closures go to www.visitogden.com/masters. For additional information and a course map visit www.usacycling.org, or for questions call 801.778.6254.